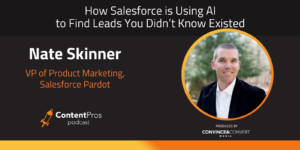 Nate Skinner, VP of Product Marketing for Salesforce Pardot, joins the Content Pros Podcast to discuss the power of AI’s place in all of the marketing puzzle, from the administrative operations to sales. Artificial Intelligence (AI) is the latest cool toy in the content and account-based marketing fields. Curating lists of pre-qualified leads for an eager sales team is now faster than ever and positively impacted by the rise in artificial intelligence. But incorporating this powerful tool takes more than a software purchase and a quick flip through the instructions. Ensuring there is solid alignment between sales and marketing is an essential step to making AI integration a winning solution for the whole brand. Once you commit to making the leap to AI, it’s important to maintain some of your old tools that worked well. Many of them can integrate with or even complement your new AI solution. Additionally, to really make AI the star of your marketing and sales team, look beyond leads to see how it can streamline or take on other operational tasks of the department. From event planning to content marketing, AI can transform an entire department into a lead generating machine. What shows are Netflix most likely to recommend for you? It’s always serving up kids’ movies. Specifically, Dinosaurs. I also get a lot of political thrillers because I watch House of Cards every chance I get. 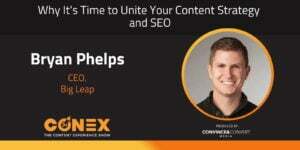 Randy: Welcome to another episode of Content Pros Podcast, part of Convince and Convert, and today, I've got Tyler Lessard joining me. I am Randy Frisch, and we've got a great guest in Nate Skinner, joining us from Salesforce. And today we're going to actually talk about AI. And it's funny. I was on a panel the other day, in Boston, and the panelists were all talking to each other as to like, how long into the conversation could we go without dropping either AI or ABM, right? And I think we almost made it seven minutes, which was a pretty big accomplishment. but these days it's hard to go anywhere without some of these new trends for us as marketers, and I know Tyler, it's creeping into your world of video, too, and everything you're doing to go to market. Tyler: Yeah, it's a fun topic. AI has been something that, I think, has underpinned marketing technology for a number of years now. But we're just starting to find the right, I think, words and nomenclature to describe how it's being used, and how we can leverage it in the future, to deliver better programs and to build better technology. But I think in this conversation, I'm really excited to have Nate here to peel back, is AI artificial? Or is AI actually intelligent? And where does all this stuff go to? So, Nate, would you mind quickly introducing yourself, and what you're up to in your role as a VP of Product Marketing at Salesforce Pardot? Nate: Yeah, thanks, Tyler, and thanks, Randy. 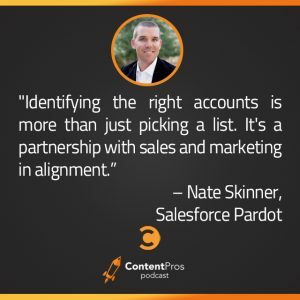 Nate Skinner, VP of Product Marketing, for Pardot, from Salesforce. I've been a B2B marketer for ... God, I'm about to age myself ... the better part of 15 years, for sure, and love working with the Pardot product, because our audience is a bunch of people that have similar challenges and opportunities to the challenges and opportunities I face every day in my role. So we are excited about the opportunity to talk to you guys today, and the AI topic is definitely top of mind for our customers, and for a lot of the audiences I get to talk to, as well. Tyler: So, one of the things to kick it off, putting on your B2B marketer hat, and looking at tools and platforms, like a Pardot, and other marketing tech that we're seeing out there. How much do you see intelligence, and automation, and things that we would call AI today, to be really a key part of those platforms? Versus what they're doing to help us simply manage and distribute email, and content, and so on. How do you view that relationship? And where is your focus now as a B2B marketer, and as a product market at Pardot, in terms of where you guys are investing, and what you see as kind of the evolution of that? Nate: Yeah, it's early days, as far as I can tell, for AI in the application of it, especially for B2B marketers. Some of the obvious areas where things are helpful, when you have AI baked into the systems you're using, things like helping you identify the right accounts, look like audiences, for instance. You can look at the attributes that make up your ideal customer profile and say, "Okay, it's companies of certain size, it's companies in certain industries." And by taking advantage of an AI platform, have the technology, the machine learning, do the discovery for you. Like, "Oh look, here's another one, just like the one you said is the ideal customer." That's pretty straightforward, and our customers are taking advantage of that today. Some of the more exciting things, as kind of to your point, is how do you take that, and do more with it? How do you take, let's say, an anonymous lead, for someone you have, but hasn't raised their hand yet? They've visited your website or something. And how do you look at those folks and say, "Oh, that looks a lot like a similar lead, or a similar contact, who converted down the funnel?" That's actually exciting, and kind of more cutting edge. And we're hearing about customers doing that, as well, with our technology. That's one, kind of, next generation applicability of AI. I think there's more, though, that we can be doing, not just in the traditional sense of what a B2B marketer's charged with, which is finding the right leads, and nurturing them along the path towards a sale, but even further down the B2B marketer's life, right? We know that it's not all about leads. Sometimes we have to manage budgets. Sometimes we have to put together events. And so, applicability to the operational side of the job is also there for AI, where we have, in Salesforce and in Pardot, Einstein is our account, artificial intelligence layer that's kind of fundamental to our platform. Having it tell us, "Look, you're looking for the right city to run an event. Well, here are where the number, the top opportunities, the top accounts there that are in love with the technology, and using it every day, based on their usage of the technology, here are the top five cities where those folks exist." Having that be part of the dashboard, without having to go run a report yourself, is also important, because we have a lot of resources. We want to go do a lot of things. But we have to prioritize ruthlessly, because we don't have unlimited resources. I think that's the case for all of our customers, and you guys can probably identify with that, as well. So, AI in that context, helping me understand where to apply my limited resources in such a way as to drive the results that we've already experienced, because the machine learning is looking at success, and comparing the opportunity in front of us. Tyler: You know, it's super interesting, and I'm going to put you on the spot in a moment here, Randy, so prepare yourself. But one of the trends that I've seen myself is, we've built a lot of intelligence into our internal systems. So you talked about things like, okay, is an individual lead ... what have they have been interacting with, so are they warm? Or, are there are certain programs that, based on our own criteria, have been successful or not? And that intelligence to help us kind of optimize how we engage with people, and what programs we run. But what I'm starting to see, that gets me really excited, is machine learning and AI are now starting to merge external data sources with internal data sources. And actually, with the event example, it's probably a pretty good one there, Nate. Because I want to know where to run an event, not just based on who my customers are in the area of what I have in my database, but pulling from external data sources, to understand, where is their market intent, perhaps, right? Like, where are there, even geographically, more people searching for information related to the event I might serve up? And I think that stuff has so much interesting potential. And Randy, I said I'd put you on the spot. I wanted you to react to that, 'cause I know, you're livin' in this world with things that you guys are doing, as well. Randy: Yeah, it's funny. I mean, I was listening to Nate in all the areas that you talk about where this could be done, potentially, right? And I think it, that's the scary part, though, right? It's exciting, in that there's so many ways that we could infuse AI. But then, you start hearing those. And it goes back to reading about the future, and watching Minority Report, where you're like, "Okay, but when's this actually going to happen? When am I going to be able to do this?" And I think, what we started to realize ourselves is that marketers are still getting a little overwhelmed by saying, "Okay, let me just take data, and figure out what to do with it." We actually, Tyler, if you recall, we had Mike Ballard, from Lenovo. They did an amazing job on a previous podcast, talking about how they built something themselves. But I think the reality is that what we need as marketers, as the vendors we work with, to start to build an AI layer into the platforms that we're already using. Because this idea of AI, like you said, Nate, it's got to apply to what we're already doing. So we don't want to drop our event tools, and our planning tools, from a marketing/planning perspective. But, rather, we want to just infuse a layer of AI into how we deliver. And that's, with Uber flip AI, that's what we did with content recommendations. Instead of that pure manual, we want to actually just, let people put a little bit of autopilot on, from time to time. Nate: Yeah, I couldn't agree more. I mean, you're absolutely right, Randy, that the kind of overwhelming amount of information ... I don't know, you guys have seen the MarTech picture. I forget the producer of that kind of landscape, of all of theirs. Randy: Scott Brinker, Scott Brinkert? Randy: An amazing job at overwhelming us all. Nate: Yeah. It's, they've gotten kind of, I look at it, and I feel anxiety. And, as a B2B marketer, which one of those do I explore, for doing what I need to do? And by the way, I can't boil the ocean. Our customers are constantly ... The piece of advice we had yesterday here in Atlanta, actually, a customer of us from UserIQ, her name's Nicole. She's the CMO there. She stood there, and I asked her, "Hey, what would the one piece of advice you'd give all these B2B marketers out here that are looking at solutions, and determining what path they should take? And she said, kind of to your point, Randy, "Start with the problem you're trying to solve. And go figure out how to solve that problem, the one that represents the biggest opportunity for you to drive the results for your business. And then, assure that you are aligned to the measures and the metrics that the company cares most about." And so, for her, that was simple, right? We need to drive lead flow. And we need to drive it intelligently, and we need to give it to our salespeople at the right time, at the right place. What that translates into for AI, though, is, "Well, we already have all these contacts. We already have all these leads. We already have all this data coming at us, from every source you can imagine." So, instead of, kind of going and getting another thing to have, tell me what leads should be routed where, what if there was AI baked in, that helped me identify lookalike audiences, for instance? Or leads that look a lot like others, that have already converted? That's the stuff that you want to take advantage of, and she suggested people think that same way about it. Then you're not overwhelmed. You're like, take it in pieces. Don't try to boil the ocean. And, of course, the best part of that, in my mind, around her suggestion was, that directly aligns with the sales team. Because the sales folks, as B2B marketers, we hear this all the time: "I'm not getting enough leads." Or, "The leads aren't getting, aren't great." Or, whatever. Or, the leads aren't getting passed in an efficient fashion. Well, as a B2B marketer, there's nothing worse than that, right? We know that lead generation at volume is one thing. But when we know that we're generating quality leads, and the artificial intelligence solution baked into our platform is telling us that these are extremely valuable, and even going as far as prioritizing them on our behalf. That's even worse. Now, you've just compounded the problem, right? Now we're saying, "Salespeople, here are the leads. They are scored very high, for a reason, because the AI layer is looking at these leads, compared to others, who have already converted. And you're not working those, either?" That's a big problem. And so, Nicole's suggestion, to kind of, pick apart a solution that you can identify, that's aligned to the business, that you can immediately put into place, and take it one step at a time, I thought, was really, really strong advice for our audience. Randy: Yeah, I like that a lot. I mean, it's funny. Don't get me wrong. The shift to AI, and the shift ahead that will happen to AI, is a huge step for us, right? As marketers, and just even in our day-to-day, in terms of how we interact. But if you look back historically, it's not as big as other shifts we've had to deal with. I mean, you think about, I would think, the biggest shift we had to deal with was going as marketers from a print world, to an online world. I mean, that was monumental, in terms of, just rebuilding everything from the ground up. Where I think we're at, and I think is what your conversation with CMOs, that you're hearing, is that it's just about adding a layer that will allow us to scale at another level. And one of the examples you just gave, Nate, really have to do with scale. I'm wondering if we can just, to truly humanize this, though, for people listening ... which we have to do with AI, 'cause it's all about robots ... maybe you can give us an example of, maybe some of the go-to markets that you've done, in your own campaigns, that have been able to leverage an AI component, in one way or another. Nate: Yeah, that's a great one. It's very much, exactly, what we were just talking about, around ... we use Einstein at B2B marketing analytics, which is in our platform. By the way, Salesforce on Salesforce, right? We use our own technology what we tell other customers how to do, a lot of times. And we use the analytics layer, which just sits on top of the Pardot, in Salesforce, to help us identify these opportunities. And one of those was around ABM, actually. We want to help our customers identify the right accounts, then identify the leads within those accounts, that are the highest propensity to buy. And so, we use ... we, actually, Einstein did it for us. We literally said, "Okay. Here are," it was a couple of dozen accounts that we all determined, in partnership with sales, to be the most valuable accounts for us to go look for. Now, Einstein and AI tell us which accounts that are in our database, already, that look a lot like these, right? So they can be discrete manufacturers, or wholesalers, or, the high tech software companies. Whatever that was, we didn't actually have to put a lot of calories into the exercise. We just said, "These are the lookalikes that are the right ones. Go find the rest that look just like these." And we ended up with a list of 800 accounts that looked just like the ones we said were ideal. And from that, then, we looked at, "Okay, well, what's the propensity to buy an ABM solution?" Not everybody, as you guys know, right, ABM's not for everyone. So, which accounts are ABM-specific, that have a strategy for account-based marketing, that we could really put something in front of them that was relevant? And from that 800 list, we had about 550. And we then generated a direct mail piece that literally was, "Hey, you've probably, thinking about ABM, or getting started with it. We think you should have a look at this, kind of field marketer's guide, to a comp-based marketing." It was the direct mail piece that had a Getting Started Guide in it, for how you should go about identifying the right accounts. How you should go about delivering the right engaging content to people, either in those accounts, or identified as associated to them, influencers, or whatever? How should you measure the results of that? We gave all that into the direct mail piece. And the results were kind of phenomenal, because you're now talking to what you know to be the perfect customers. And you have more data about the fact that they're probably considering ABM. Most are, anyhow. And then, we delivered a piece that was highly relevant for them. So that was a very recent exercise we went through, and it had tremendous results. Randy: I love that case. What I think I like about it the most, for, just to kind of break it apart is, it shows that, as marketers, we still need a balance of art and science, right? I mean, yeah, you're able to leverage the AI component, to break down that list, and find the lookalike account. But you still had to pull in all the creativity aspects of executing a campaign, and even to a degree, pulling in those ABM factors. So I think that's something for us to keep in mind as marketers. And we're going to come right back, for more insights from Nate Skinner. But we're going to take a quick break, and hear from some of the sponsors that help make this podcast possible. Tyler: Welcome back to Content Pros. It's Tyler Lessard here, as with always, Randy Frisch, from Uberflip, and our guest today, Nate Skinner. We were just starting to touch on the use of AI and artificial intelligence in an account-based marketing strategy. So, using insights, under the covers, over the covers, to better understand who our potential buyers might be, and help us prioritize them. And, you know, Nate, one of the things I wanted to follow up on that, is ... how do we think about using intelligence and insights and data, beyond just identifying those target accounts that we should be going after? So I think that's a hugely important step, as we think more about an account strategy. And I've seen ABM work in our own business, to help us identify, "Here are the 100 or 150 that are most likely to buy, or have the highest propensity to engage." Once we get started with that, what's the next step? And how does AI, or does it, play a role in the actual engagement strategies with those accounts, once you've gotten their first, and sort of, bite? Nate: Yeah, Tyler, that's a great question. And, actually, exactly what I think most customers out there that are thinking about ABM are thinking about, too, right? Like, okay, I've got my list now, but ... and the next step is, in our opinion, is making sure we're delivering account specific content and offers that are relevant. Not just to the accounts you identified, and the leads or contexts you have at those accounts, but also, there's a bunch of people you probably don't know, at those accounts. We could use any example you want, but let's just use Salesforce. If you're a company out there that was trying to, you've identified Salesforce as the account you'd like to market to, there's 27,000 people here. So, now, how do you put offers and content and experiences in front of the right people at this account? And maybe even the people you don't even know yet, to make sure that they're receiving a message that's relevant from your business, whatever it is you're trying to sell us. That's where AI can really help, as well. Because it can say, "Look, I know Nate Skinner is an employee of Salesforce. I can have the machine learning capability of an Einstein go look at that contact detail, determine things like, title, role, organization, potentially, geography ... I live in Atlanta. And that can help inform, with rules, and kind of, the magic of machine learning. It can help inform whether that person should be getting a particular offer. Should we offer A? Offer A goes to anyone, VP and above. Offer B goes to the operators and practitioners in the sales organization. And Offer C goes to anybody that's in IT. You can do that with AI, because it can go and kind of mine the contact data that you have. And if you don't have it in your CRM, you can use the data exchange and the app exchange for all kinds of data augmentation from other sources. I think Randy mentioned that earlier, like, using data providers to clean up your data as a really good step in this process. But once it's nice and clean, you can literally use AI to determine which offers to give to who, based on who those people are. And that's kind of, next level, and we're seeing customers have tremendous success there. Tyler: Yeah, that's the stuff that gets me really excited, as you look at this long-term. And it brings it back to the topic of content, which, of course, we focus on a lot here with our audience. And it's that potential to be able to serve the optimal content to each individual. And it's something that's so close to my heart, because, as a marketing team, as well, we produce so much content. But my biggest worry is, is the right piece getting in front of the right person? We've got 120 e-books, and 500 videos, but I'm never sure if the right person is really getting the right piece of content. And I think I got a lot of work there to do, in our own team, and how we do that. But I ... yeah. Nate: I was going to bring that back up. I mean, Randy, you mentioned it earlier. It's like, not only is there tons of content, and Tyler, your point around, "Is this e-book or this particular offer the right offer for that person?" But there's this other thing called, "I don't know the people at the company that are the most influential." And if I don't know them, they're not in my database, I don't have their details. So, how do you go find those people, too, and engage them with something that's relevant? And maybe they're the Millennial generation that's not in, looking at their emails. They're not necessarily going to a landing page. They're actually browsing in SnapChat. Or they're in Facebook, or Instagram, or somewhere else. And the offer would be more relevant to them, delivered there. So how do you know where to put it, and why? And that is where AI can really help. Because it can help you understand, and basically, segment your audience in such a way, that you could deliver those very specific offers to the right people, and even people that you don't know, based on the machine learning that's giving you the insights that you don't have, manually. Tyler: So how do people really think about getting started with this? And you've mentioned that, I think, Nathan, you were talking earlier about your event recently. I think there was a very good piece of advice, which is, "Start where you're solving a real problem, and where you believe you can get a big impact." And I think, for us, and many, it starts with your core marketing automation problem. And your marketing orchestration engine, which for a lot of people will be Salesforce Pardot, and then, solutions of that nature. So I absolutely see that those platforms need to continue to evolve with AI capabilities. 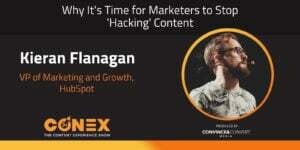 Is that the place most marketers are starting? And then, what other solutions are they thinking about, as a way to bring some of these ideas to life, in their businesses? Nate: Yeah, I mean, I know, I could be biased. But I do take off my Salesforce hat, and I've done work for other companies in the past. And I was a B2B marketer elsewhere. And I can tell you that account-based marketing starts with accounts. So, identifying the right accounts is a key thing. One thing that's in, as a step, to kind of, Tyler, to your question ... is like, that's a step you should absolutely take, in partnership with your sales leadership, and your sales organization. Let's identify the right accounts, and all agree, that these are the right ones. But as a marketer on the cutting edge of applying AI to this ABM exercise, what if you went into that room and said, "Now that we've identified them, I'm going to let AI, and Einstein, in our case, help me identify those that we may not have picked. Because we didn't even know they existed." I used this example the other day with a customer. We were talking about, now, we've picked the account list. And it's 100 accounts. My point was, "Well, what if there's 200 others, that you're just not thinking about, because you don't have them in your databsae?" And my example was, if you were trying to sell commercial furniture to companies who are building out offices in the Atlanta area ... I live in Atlanta ... and you only have it, your 100 accounts are those companies in the Atlanta area that will buy, or have bought, furniture before. Well, you're missing out on all these upcoming startups, and kind of, well-funded new unicorns, if you will, that are about to go buy furniture in bulk from someone. And you just didn't have them on your list, 'cause you didn't even know to put them on the list. That actually is where AI can be extraordinarily helpful. Because it can use other data sources to look for audiences that look just like the ones you know are prefect for your solution. And that is like, Step One is, yes, identify the right accounts and partnership sales. But then, go further as a B2B marketer with AI, and say, "Hey, guys, we should actually add these other 50, that we didn't even know we should." Tyler: Yeah, it's super interesting. And I think, for a lot of people, it sounds like a little bit intimidating. But I found, again, once you've got the right solution, and then, you just have the right mindset, that it can actually be pretty straightforward to get into gear. And you don't have to boil the ocean. You don't have to put on a huge ABM program or AI program. It's about flipping some of those switches, and starting with some of those incremental steps of just, let's start with it, to identify accounts, and prioritize. And then, we can sort of elevate from there. Randy, I'm going to give you a softball here. And this is purely because, I actually think what you guys have done is exceptionally cool. Would you mind, just 20 seconds, telling people what you guys did with Uberflip AI? 'Cause I think it's a really interesting example of how you can do something pretty simple, but that can have pretty big impact. Randy: Yeah, sure. But, without even plugging what we do, even, maybe I'll give even people a nice framework to think about how we built our AI engine here. And it's really three words that we ended up kind of summarizing it. It's rules, audiences, and data. Right? And if you can think of those three. So you start with, let's start with audiences, right? As Nate touched on earlier, that's understanding who you want to target. Do I want to target someone from Atlanta, who's a CMO, and so on, and everything around that, right? The next one, obviously, is data. We need those data sources. Now, some of that data can live in our marketing automation system. I mean, think about all the inputs that are going into your marketing automation, on an ongoing basis, right? And all the engagement of where you got that cookie dropped. All the contact details that start sitting there, all that information. In our case, we actually also started to tap into third party data. So we do that, through partners like Bombora. If you've heard of Bombora, they can actually track what your visitors are doing before they even land on your site. So that we don't have to wait to learn about these audiences, but we can actually learn about them before, right? And once you have audiences, and data, then you just need to apply rules. And that's exactly what Nate was telling us before. It's, okay, if it's this audience, and then, I want to use this data first. Or I want to use this data to make my decision, before or after. And you start to think about that framework in anything that you're doing, and it becomes very simple. And that's where, as we said at the beginning, if you have solutions, that have the infrastructure to deliver out some sort of decision, using it to layer in these new rules and audiences and data to accomplish that. And that's what we did with content, is serve up content to the right audience, using the data and rules that you've got in the systems that you already have in place. And in our case, we were just serving up the next piece of content, instead of what you had manually said in a more automated fashion. Nate: That's really cool. And what's really cool, too, is that, how similar that is to kind of, this broader direction that we keep on revisiting with our customers and our audiences, which is ... Identifying the right accounts is more than just picking a list. But it's also a partnership with sales and marketing alignment. And then, what you just said, like, now, you know who they are. You used these other data sources to augment the information, set up your rules, and then, by definition, you will improve engagement within that account. Because you're delivering relevant content to the right person at the right time. And that engagement improvement drives the results that you're looking for in the first place. It fascinates me how many people ... I think Cindy Zhou, from Constellation Research, published this paper. And I encourage everyone to download it, and search for her name, and Constellation. But it was something like, 90% of her customers who inquire about ABM said they plan to implement ABM strategy this year. But only 20% of them said they had confidence in their ability to execute that strategy. It has a lot to do with what Tyler, you and Randy, both said earlier, about the confusion in the market, and the vast number of vendors pitching solutions. But it also had to do with not actually having a clear line of sight into the steps you should take. Identifying those accounts. Improve the account engagement with content that's relevant, the way Randy just described. Making sure you don't forget to synchronize with your business and your sales partners. And ultimately, constantly revisit the effort itself, to assure you're getting the results you hope to get. And that's like, measurement, and modify, and optimize, using analytics in the data that you got. Randy: Yeah, I think that's really well put, Nate. And I think what you're also pointing out is how early we are. And all these buzzwords, as we said at the beginning, are part of every conversation we have as marketers that's talkin' about what we're going to do next. I mean, the number of people I talk to, who are overwhelmed by ABM, is overwhelming in itself, right? I mean, there's no best practices that are really, really established, at this point. And there's not that many gurus out there. So a lot of people, I think, are learning as we go, and as things change pretty quickly. And it's been a lot of fun to have the conversation between the three of us. So, at the end of our podcast, so, what we always like to do is just get to know the person behind. So, just trying to figure out the first question to ask you, it's kind of hard to dig up too much on you, on the Web. But I figured, we'd, let's first stick on AI. All right? So, first, we're going to go movies. So, what was your, I don't even know if you saw either of these movies. I'm just taking a stab. AI, with Haley Joel Osment? Or Ex Machina? Did one of those resonate with you? Nate: Ex Machina. I didn't see the other one. Nate: Yeah, but, I mean, this, actually ... it's funny, because movies like Ex Machina, they impart this fear on you about the extensive, the extent to which this stuff can come to life. I think, it actually, on the one hand, is exciting to think about what's possible. On the other hand, for a B2B marketer, this kind of stuff gets scary. I think we talked about it earlier, right? It's like, "Holy cow, where do I begin? And what do I need to do, to make this even possible, with the tools and the systems and the processes and the people that I have? Because the finished product is so advanced, compared to where I am today." And I think that causes people to have anxiety. Randy: Good call. I was going to throw Westworld in there, too, but I was trying to stay more movie, and whatnot. But as long as we're going there, I mean, one of the other cool similarities between content recommendations, and everything we've been talking about today, is things like Netflix. So what shows are Netflix most likely to recommend for you? Like, when you're not in work mode, what is the stuff that it's serving up for you, based on your past watching habits? Nate: Well, it's always serving up kids' movies. Randy: Don't you hate it when they cross into your account? You're like, "No!" Randy: I wonder if that's AI, or a little bit of Netflix manipulation. Nate: It could, that's a good question. I probably don't know. Randy: Awesome. Awesome. Well, Nate, this has been so much fun chatting with you today. We've really enjoyed it. People want to learn more. 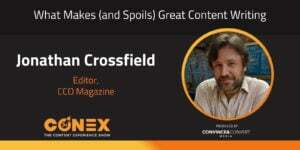 What's a great place to read some of the content you're creating these days? Nate: Yeah, thank you so much, guys. I really appreciate it, Randy and Tyler both. You can always visit pardot.com for more about us, or salesforce.com, slash, pardot. Randy: Awesome. On behalf of Tyler Lessard, over at Vidyard, I'm Randy Frisch, at Uberflip. This has been the Content Prose podcast. You can check out more of our past episodes at contentProspodcast.com. Leave us a review, wherever you find it on iTunes or whatnot, and let us know how we can make this a little bit better, at least, until the machines start telling us how to do so. Until next time, this has been the Content Pros Podcast.